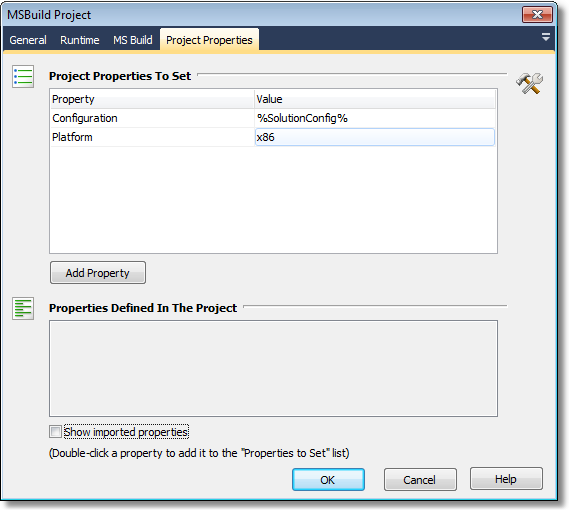 This action allows you to build MSBuild projects as part of your FinalBuilder build. 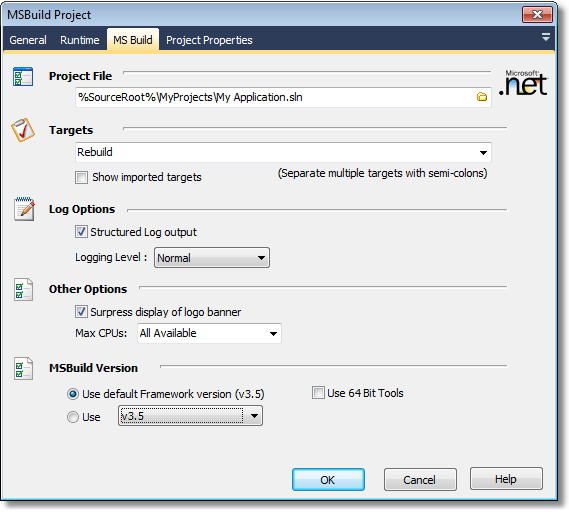 MSBuild is Microsoft's build technology for .NET, and is used by Visual Studio 2005 and 2008. The MSBuild Project action can build project files and solutions created by these versions of Visual Studio (ie csproj, vbproj, sln.) Alternatively, you can use the Visual Studio action to build these projects. Note that if you use the MSBuild Project action, you do not need Visual Studio to be installed on the build machine. The MSBuild project file to build. Files can be .proj, .csproj, .vbproj, etc. or solution files with the extension .sln. Select one or more targets to build. Separate multiple target names with semi-colons. If this field is left blank, the action will build the default targets. The dropdown list is automatically populated with any default target names for the specified project, as well as any targets defined in the project file itself. Check this box to have FinalBuilder log the output from MSBuild in a structured and hierarchical manner. This can be very useful when viewing FinalBuilder logs. If the box is unchecked, MSBuild will use the standard console logger - so the output will be the same as if MSBuild had been run from the command line. MSBuild supports different logging levels. Choose "Detailed" or "Diagnostic" to see lots of extra output in the logs (useful for debugging.) Choose "Minimal" or "None" to minimize the size of the logged information. By default, MSBuild logs the current MSBuild and .NET Framework versions. Check this box to exclude this information from the log. The MSBuild action can use the default FinalBuilder Framework version (set in the .NET Options), or you can choose a specific framework version to use. On this property page, you can set any project property values to be passed to the MSBuild project. The "Properties Defined In the Project" list automatically shows all of the properties found in the project file. Double-click a property to add it to the "Project Properties To Set" list. To add other properties to the list, focus the last item in the Project Properties list box (as shown) and press the "down" arrow key. By default, only properties which are defined in the actual project file are shown in the list. Checking this box will also show properties which are imported from other files. Note that this list may be very long.